The moment we hear the phrase “Internet of Things”, we juggle up the images of the automated personalized advertisements and smart machines. But, when it comes to IoT in fashion industry, the trend points to highly personalize and optimized shopping experiences, which means now it’s time to carefully examine this opportunity. The intersection of fashion and IoT -Smart Clothing; continues to attract an extraordinary amount of attention from designers, investors and consumers. The “intelligent store” will tentatively count its own inventory and serve the shoppers like human intervention. Person’s capability to communicate with the objects could be changed based on their immediate needs. As per the research, one of the English designer Sean Miles designed Bluetooth-enabled glove with a microphone which can be interfaced with a smart-phone to make phone calls. This technology would prove valuable to the employees whose job requires them to wear glove for whom using a mobile without taking their gloves off requires considerable dexterity. Many other firms are also working on this technology of using mobile devices whilst wearing gloves, and have also shown their innovation with the stainless steel fiber gloves which enable the wearer to use touch panel devices. When it comes to the connected footwear, sports enthusiasts are the people to target. In 2004, Adidas was the first shoe company to feature a sensor embedded in the heels. In the middle of the sole, generator machine is attached which enables the shoe to adjust itself after each stride. Machine on turning the screw changes the compression characteristics of heel pad. After this successful attempt, Adidas applied similar technology to the basketball shoes, by configuring some special chips for performance tracking. In 2013, Google was also up with talking shoe which can give encouragements and compliments to the wearer. Similarly Nike came out with HyperAdapt 1.0 Self lacing shoe which is turning out to be a game changer in fashion internet of things industry. In 2011, two fresh Indian engineers from MIT introduced an electric sole that can guide the visually impaired via voice directions and online maps which can be used offline. The boot features an ultrasound barrier sensor. With things being realer, it’s only a matter of time that other wearable will also adapt internet of things enhancing the human life altogether. Wouldn’t that be awesome? No more searching for Shirts, tie, socks etc. 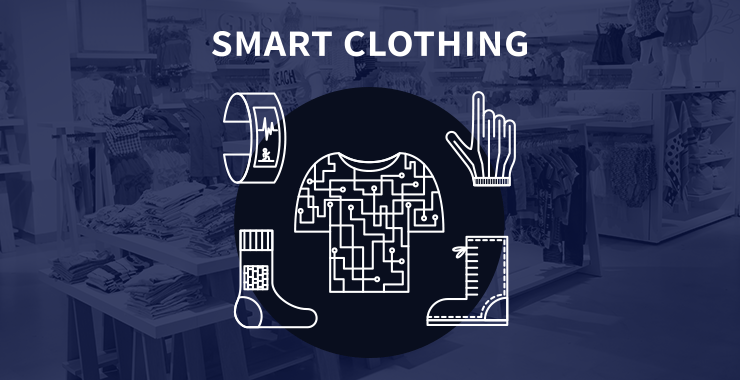 If you have IoT enabled smart clothing, sensors in clothes will lead you right to where it is. This offering works for both- the providers and the consumers. Consumers can track lost items, so can suppliers. No more shady returns when consumers don’t like what they brought- an IoT handbag will tell when and how it was broken. IoT sensors can help you in a great way making your brand tamper proof and authentic at the same time. Smart clothing is also being designed to monitor patient’s condition in hospitals. Smart clothing is also being used for automatic GPS location or triggering alerts when exercising in high risk condition such as night time. Inspiring and engaging the consumer through IoT technologies is the next step in fashion industry; and retailers need to be aware that many of their competitors are already out of the blocks in their IoT strategy. Ultimately, IoT is still very much in its infancy. The future is undoubtedly filled with demonstrations of software, hardware and standards which facilitate to bring the industry closer to IoT reality. For most of the company, IoT is already on the verge to come forward with innovations are already in the work. These companies are aware of the fact that fading to scrutinize IoT’s precious opportunities means risking of their own future. Keeping up with the healthy knowledge of IoT is the key to success.